Fight these dark mornings and nights. As we enter February, the winter is by no means done with us yet. To help keep you safe and seen in the dark evenings and mornings, we've teamed up with our pals at Coleman to offer one lucky so-and-so the chance to walk away with one of their new Divide+ 200 LED torches. Fancy that? The Coleman Divide+ 200 LED Torch is a pocket powerhouse of illumination. The LEDs can shine as brightly as 200 lumens on the high setting, casting the light up to 200 metres. On low setting, with a light of 20 lumens, the beam will still shine up to 70 metres, making it the perfect everyday carry flashlight. 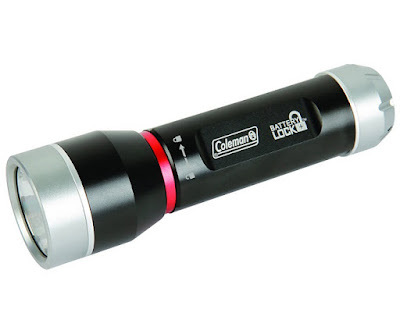 As well as being bright and light, the Coleman Divide+ 200 LED Torch will also save your batteries, too. When not in use you can activate the BatteryLock mechanism to preserve the life of your batteries, meaning that even if you stick it in the kitchen drawer for a year, it'll still be usable when you dig it out in an emergency. To enter simply follow us on Twitter (@thetestpit), retweeting any tweet we've posted about the competition, or Like us on Facebook (/thetestpit) then share the competition post. Do either of these things before 6pm on 3rd February 2017. The competition will close at 6pm on 3rd February 2017 and the winners will be notified soon after. UK entrants only please. To win the entrants must be either following The Test Pit on Twitter, or have previously 'Liked' The Test Pit's Facebook page. The judges' decision is final. For T&Cs please send us an email.